Tomato Soup Recipe. 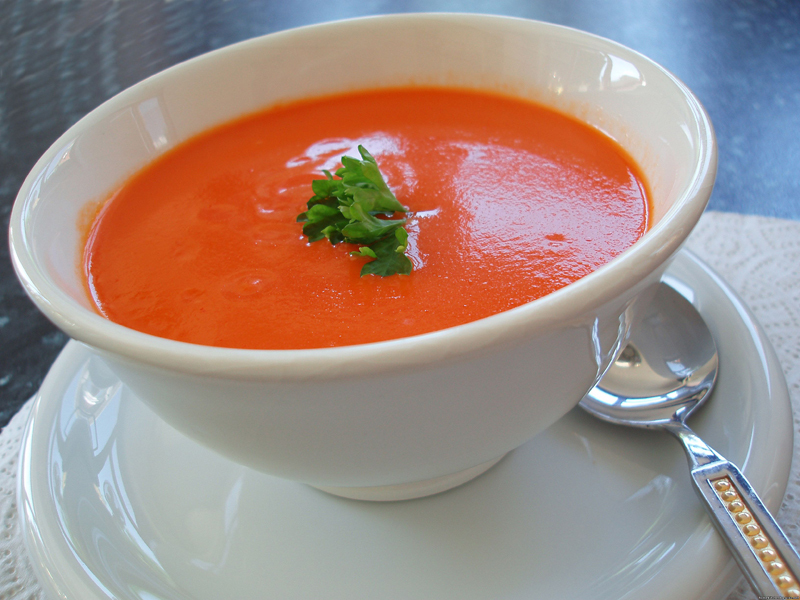 One of the best remedies to fight off winter colds and coughs – a good, nutritious, homemade tomato soup. Full to the brim with goodness! Delight in our Tomato Soup recipe. Place a pan on a medium heat, add the oil and butter, stir well and allow to melt. Once melted add the onions and chopped garlic and stir. Sweat the onions until they have a little colour, stirring occasionally to prevent them from burning. Add the tomato puree, chopped tomatoes, stock, stir again and bring it to the boil. Once boiling, cover and turn the heat down to a simmer. Leave to cook for 30 minutes. Once cooked, remove from the heat. Remove the lid and with your hand blender, pulse to blend the soup into a rough puree, taking care not to raise the stick blender out of the soup! Finally season with salt and pepper. Place the sieve over a large bowl and ladle the soup into the sieve. Using the back of the ladle, push the pulp down into the bowl below. Continue until all the soup has been sieved and transfer it back into the pan. Reheat if necessary. Pour into soup bowls and add a dash of cream just before serving! Serve with some fresh crusty bread and enjoy!